We bring out my prized Mexican clay cazuelas to make this dish. The meat simmers in the large earthenware pot, bubbling slowly on the stovetop soaking up the red chile – pepper sauce that infuses each morsel with its smooth earthy heat. A burrito? A taco? either way Delicious! In Mexico sauces are deeply integrated into the preparation of the dish. Use this sauce to make chile con carne or as the base for a succulent pork stew. Remove the stems and seeds from the chiles, place in a bowl. Cover chiles with boiling water and let soak for about 20 minutes. Remove chiles from water with a slotted spoon and place in a blender. Add about one cup of the soaking liquid and puree the chiles until smooth. Heat the oil in a heavy saucepan or cazuela over medium high heat. Sauté the onions until softened about 5 minutes. Lower heat to medium; add the garlic, and continue to cook for another five minutes. Strain contents of blender into the pan, it may be necessary to push the chiles through the sieve with a wooden spoon. 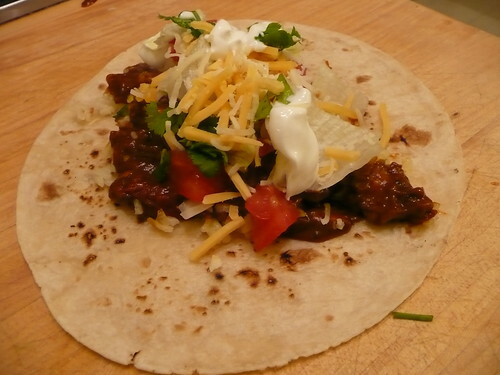 ( add the optional ancho chile powder at this time.) Simmer and stir the chile mixture until it darkens a bit, about 5 minutes. Add the tomatoes, spices and mix well. Reduce heat to low and let the sauce simmer for another half hour. Add broth if needed to keep a sauce like consistency. * To make chile con carne; lightly brown boneless pork or steak cubes with the onion and garlic. Proceed with the recipe and simmer until the meat is fork tender. This entry was posted in Recipes, Salsa and tagged Mexican recipe, Mexican sauce, anch chile, chile colorado, chiles, mexican cooking, salsa. Bookmark the permalink.